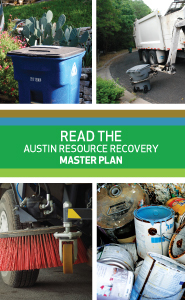 Zero Waste policies and ordinances allow the City of Austin to influence all the materials generated and distributed within the city, including those not directly collected by Austin Resource Recovery. By setting an example through consistent policy-setting, the City of Austin can achieve Zero Waste citywide and lead the region and the state in waste reduction. This page provides a summary of the Universal Recycling Ordinance and the complete ordinance language.